The global health and climate community met in Paris last week to highlight the insidious link between health and climate change and demand more explicit recognition of this link in climate talks, agreements and global action. 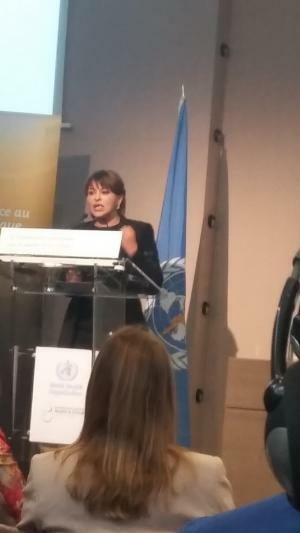 The World Health Organization (WHO), along with the government of France, which holds the Presidency of the Conference of Parties (COP) to the UN Framework Convention on Climate Change (UNFCCC), had jointly hosted this second global conference on health and climate to seek building of healthier societies through implementation of the Paris Agreement. The high level meeting with health ministers, leading health professionals and civil society actors made a plea to use the Paris climate treaty also as public health treaty. As the COP baton is being handed over from Paris to Marrakesh, the two COP presidents came together on one platform to acknowledge the urgency of the need to integrate health concerns with climate change. Present COP president Ségolène Royal who is also Minister of Environment, France, said, “Combating and defending public health need political movement and action on a world-wide scale.” People do not see the global warming goals and benefits that span over centuries. But health goals and disease reduction are more concrete and immediate. The tangible and staggering costs of health can balance the two pillars of the framework convention—adaptation and mitigation. The health sector will have to deal with health consequences of climate change and it is therefore very important in adaptation. 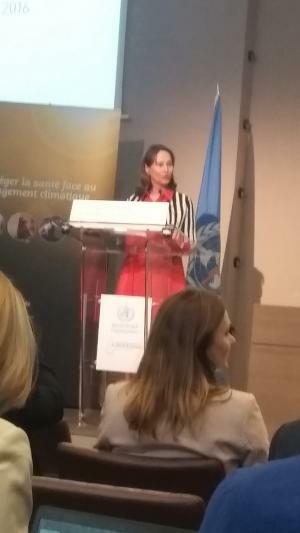 The fact that health is likely to be firmly placed on the climate agenda was highlighted sharply by the next COP President, Hakima El Haite, Minister of Environment, Morocco who said, “Health is lacking in the climate agenda. Integrate that with the global agenda.” Morocco, which is getting ready to host the next COP in Marrakesh in November, noted that this defining of the health and climate action agenda is unprecedented. The Marrakesh COP will have a strong health commitment with the support of the WHO. There will be a health summit along its sidelines. On the occasion, the WHO launched the "Breathe Life Campaign" and put out the stunning reminder that according to the Global Burden of Disease, 23 per cent of global deaths were linked to the environment. Climate change is likely to kill an additional 250,000 or more people each year by 2030. Most of these deaths will occur due to climatic stress, food insecurity and vector-borne diseases. Deaths and devastation from extreme weather events magnify the health burden several times in the developing world. Climatic stress like drought can also escalate conflict as seen in Syria. The stark spotlight was put on air pollution that kills around seven million people globally and is also a climate rogue. The fact that health cannot be delinked from the climate agenda came out sharply from the analysis of the Intended Nationally Determined Contribution (INDCs) carried out by the United Nations Climate Change Convention (UFCCC). Tiffanny Hodgson of UNFCCC informed that as many as 66 per cent of the INDCs submitted by 190 countries had included health as one of the prime focuses. As many as 74 per cent had taken on board action on health in terms of adaptation and 15 per cent in terms of mitigation. Developing countries had a greater focus on health in their respective INDCs. Focusing on health has become crucial as the impact of climate change will increase in the future even if energy emissions reduce. Most worried were the small island nations present. The health minister of Dominica from the Caribbean region alerted that the ravages of climate change had destroyed 75 per cent of the nation's annual GDP. Maldives added that their disaster risk was as high as 83 per cent of the GDP. Health ministers from Sierra Leone, Uganda and Libya reminded that the disease burden from climate change in Africa was already increasing even though the continent was not responsible for climate change. Responding to this concern Flavia Bustreo, Assistant Director General at the WHO said the Right to Health, which is in the preamble of the Paris Agreement, needs to be in the main text of the Agreement. The original principle of the climate convention—common but differentiated principle (CBDR), would have to remain the defining parameter. No one should be left behind. In the health sector, finance had to address CBDR and address the priorities of adaptation and mitigation differently for countries, she added. The live document that was put out at the end of the discussions, sought to scale up finance and investments in climate change and health and leveraging of climate funds. Tiffanny Hodgson of UNFCCC pointed out that so far, the share of climate funds invested in health was minimal—about 1.5 per cent of climate funds had gone to health. There was a lot of talk of scaling up investments to reduce the health impact of climate change and doubling investment in climate change adaptation and connecting different sectors. The small island countries made a strong plea for financial mechanisms to address the health impacts of climate change. The western Pacific nation of Tuvalu sought the setting up of Trust Funds under the UNFCCC for small island nations and least-developed countries. But there is still no clarity on how this would work globally. The US said it was doubling investment in climate change adaptation. The United Kingdom (UK), while highlighting its commitment to climate funds, said there was a shift in their policy towards urban policies and integrating health and resilience criteria. But this did not outline the global financing mechanism that would work for health. The UK only said that the first lot of funding globally would come from foreign direct investment and private sector investment and that needed a national framework in place. The global mechanism still remains an uncertain area. Within the fiscal discussion, yet another concern that surfaced was how fiscal subsidies in different regions were distorting markets for polluting technologies. Helena Molin Valeds, who heads the Climate and Clean Air Coalition, pointed out that industry moves out of one market to another, depending on the local fiscal regime. This observation has implications in light of the WHO estimates that USD 5.3 trillion a year is the global energy subsidy that is half of the unpaid health bill from air pollution. It was clear to all that health and climate change need short- and long-term frames to lay down the terms of priorities and solutions. For that both, health ministers and finance ministers of countries would have to come on board. The critical question however remained around the vision for financing and the actual health financing mechanism that the global community would have to sort out soon. There was a pitch to set aside at least half of the green climate funds for adaptation to address these health concerns. The discussions around the science of air pollution and climate change established clearly the insidious link between local air pollution and global climate change. Several of the local air pollutants that harm health including tiny particles containing heat-trapping black carbon and ozone among others, have a strong global warming potential. Climate scientist Veerbhadra Ramanathan from Scripps University who highlighted this linkage, emphasised that science had to speak out more loudly and there had to be an emphasis on urgency of action. Carlos Dora of WHO emphasised that “air pollution is big and getting worse in cities, it is very visible, and people are angry. This is an important entry point. Public health response does not include air pollution yet.” This was serious as more people would now live in cities—60 million more urban residents would come to cities in the future, leading to very high exposure, he added. Climate change cannot be fully addressed without addressing air pollution and energy systems together. Representatives from the International Energy Agency (IEA) highlighted their recent analysis of energy systems and air pollution and health impacts that had shown a decoupling of trends in energy use and emissions in many countries and the health impact deteriorating despite these. This was mainly because the population was growing and ageing. 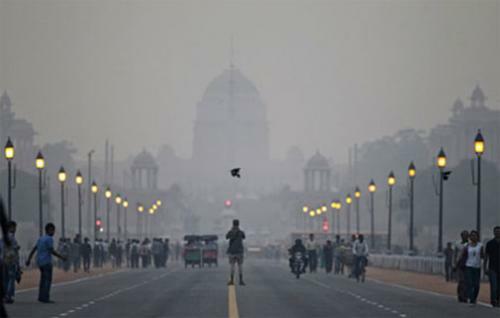 Pollution and health risks would need to decline significantly to offset these health impacts. This required even deeper cuts in local and global emissions. Emissions in some cases were increasing, especially in regions like Africa. With increased energy investment, it was possible to reduce premature deaths. Cities are shaping public health, depending on their buildings, transport, and food systems. The critical need is to integrate health with urban policies. The health sector's response is important. But city initiatives do not include health criteria yet. Alejandra Rossettia, a consultant to WHO, emphasised that “there is a need to incentivise cities to be healthy. Regulatory structures and budgeting are limiting factors today as cities are still preoccupied with conventional approaches that create more problems and block right solutions.” This, as came out subsequently, locks in enormous ill-health and pollution in the infrastructure. The consensus was that if health was integrated it would help to target opportunities, promote integrated health mitigation strategies, strengthen core public health functions and build capacities to scale up energy and health practices. Carlos Dora explained that this would help to provide authoritative and evidence-based guidance on health risk benefits and provide health leadership in multi-sectoral decision-making. There was already strong scientific evidence. The new challenge was to take advantage of health co-benefits and leverage UNFCCC platforms to work for health. Maria Neira of the WHO, while summarising the next steps and the agenda for the next COP at Marrakesh, emphasised that there should be comprehensive mainstreaming of health system; inter-sectoral governance; capacity building of the health workforce; promotion of climate resilience planning, and sustainable technology and infrastructure. Health is certainly the most compelling argument that can change the way the world is addressing the transition to ensure well-being for all. This is also the most powerful tool to integrate equity with solutions.